Century Arms N-PAP M70 represents a refinement of the garden-variety AK, with many ergonomic upgrades. 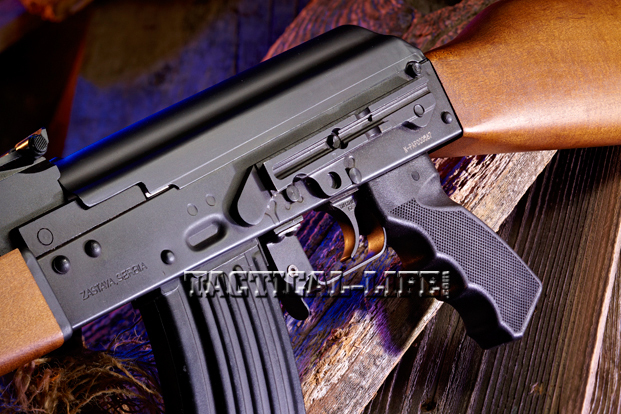 Built by Zastava and imported by Century Arms, the N-PAP M70 represents a refinement of the garden-variety AK, with many ergonomic upgrades. The skeletonized front-sight base (adjustable for windage and elevation) has concave ears that protect the front post from rough handling. The takedown latch at the rear of the N-PAP M70’s top cover was well-fitted, making disassembly and reassembly a breeze. Note how the rail for attaching a scope is mounted to the receiver’s left side. Magazines rocked in and out of the well without any binding or drag. 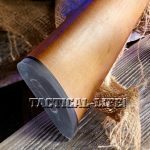 A thick, cushiony rubber buttpad makes the N-PAP M70 more comfortable to shoot and helps keep the stock anchored in the shoulder pocket. 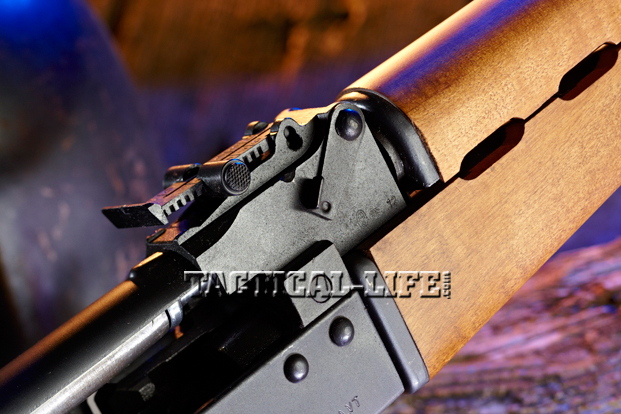 The N-PAP M70’s takedown lever for the gas tube is located on the right-hand side of the gun on the rear-sight base. The N-PAP M70 features a synthetic pistol grip, whose ergonomic contours and texture ensure better control. The N-PAP M70 has a surprisingly effective wedge-shaped muzzle brake that helps control muzzle rise, facilitating faster follow-up shots. Century International Arms has combined a battle-proven design with new parts to make the N-PAP M70, a hard-hitting, smooth-handling and rugged tactical carbine. Built by Zastava, the same factory that produced the M70B1 and M70AB2 for the former Yugoslavia, PAP rifles represent civilian versions of the M70 series. 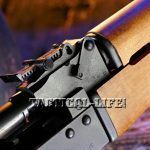 I recently had a chance to review the N-PAP M70 “Classic,” which features a fixed wooden stock and a synthetic pistol grip. It also has a scope-mount base on the left-hand receiver wall and a hammer forged barrel for extra durability and corrosion resistance. 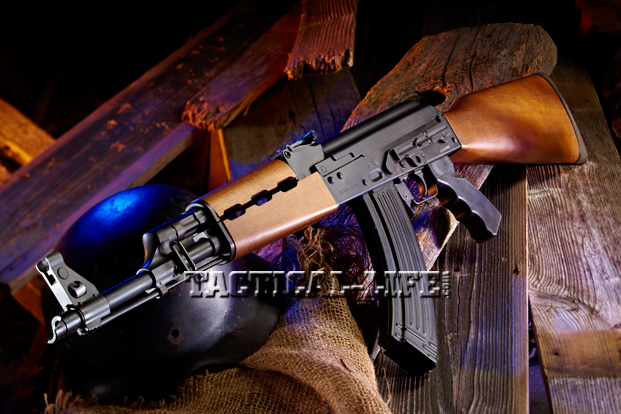 Century and Zastava have put a lot of effort into refining the AK-47 system and that shows in the new N-PAP. One could make the argument that, to achieve the AK’s legendary reliability and durability, all of the AK-47’s other performance metrics—especially accuracy and ergonomic—were sacrificed, a drastic but wise decision. The AK-47 was made for a conscript army of peasants, so it had to tolerate neglect and outright abuse. It also had to be reliable under the most extreme environmental conditions imaginable. The Soviet Union was a big country that stretched across two continents, and its climate was punishing. Each winter, snow and bone-chilling cold blanketed the steppes. Every spring and fall they were drowned beneath sticky black mud; every summer they were choked with dry dusty heat. Handing a Soviet soldier a precision-made, high-performance firearm would be an act of cruelty. The AK-47 was the ideal service rifle for both the man and the land he defended. 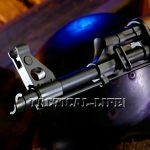 Its simple and rugged mechanism included a long-stroke gas-operating system with a piston located above the barrel, a time-tested and well-proven system. The bolt carrier and piston are a one-piece unit. A fixed cam on the bolt rides in a kidney-shaped groove in the underside of the carrier that rotates the bolt in and out of battery. Two horizontally opposed lugs on the bolt body lock up in corresponding locking recesses in a barrel block that is housed in the stamped steel receiver. The bolt has a deeply recessed face and a massive claw extractor, and a fixed-blade ejector is welded to the left-hand wall of the receiver. 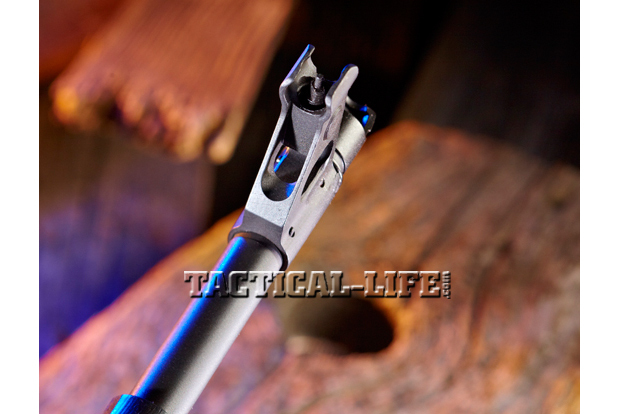 The recoil spring is conventionally located behind the bolt carrier. Horizontal guide rails welded to the receiver guide the travel of the bolt assembly. I use “guide” in the loosest sense of the term because the bolt assembly bounces up and down and left and right like an enraged bull at a Wild West rodeo. I’m convinced that about all the rails do is keep the bolt assembly from bouncing out of the gun. Every design element and choice of materials was geared toward ensuring reliability. The parts count is kept to a minimum, and the bore and gas piston are hard-chromed for durability and resistance to corrosion. 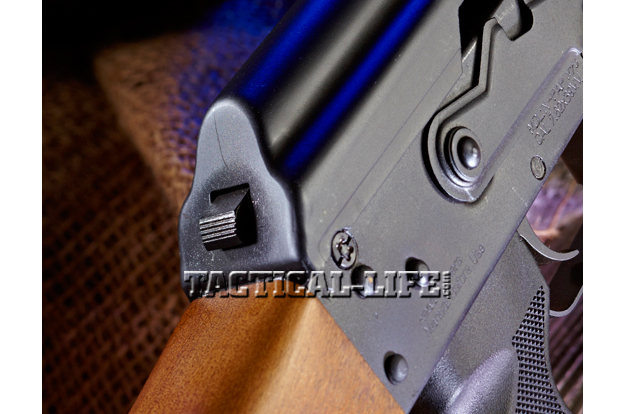 The AK’s mechanical layout is simple, but its simplicity has a purpose: keeping it working under the worst conditions. Ergonomics were a low priority. Many of the AK’s design elements were throwbacks from another era. Rather than an inline stock for better recoil control, the AK has a short stock with a steep drop, making the weapon a handful. It rocks and rolls regardless of whether the selector is on semi- or full-auto. Solid follow-up shots require extra concentration and effort. 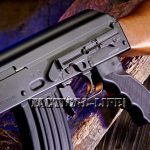 With the N-PAP, Zastava and Century set out to refine the AK-47 platform and address a number of its ergonomic issues. The N-PAP was developed with an eye for quality as well. For example, the N-PAP is not made from parts that were stripped from a surplus gun overseas then cobbled together here. Each and every component—including the hammer-forged, 16.5-inch barrel—is new. Some of the N-PAP’s furniture is inspired by the AKM. For example, the barrel is fitted with an AKM-style, wedge-shaped muzzle brake retained by a plunger. Another AKM-style feature is the arrangement of semicircular vents on the gas block. A one-piece, steel cleaning rod is retained underneath the barrel. A skeletonized front-sight base has curved ears to protect the front-sight post, which is adjustable for elevation and windage. 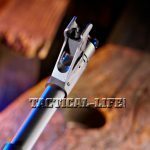 The rear sight consists of a U-notch fixed to a ramp with range call-offs indexed in 100-meter increments out to 1,000 meters. A fixed sling loop is pinned to the left-hand side of the gas block, but mysteriously there is no corresponding sling attachment point on the stock. Overall the stock has more mass than that of a standard AK. The comb is taller and wider as well, so it offers the operator the potential for a better cheekweld. The stock is also fitted with a gently curved recoil pad that conforms to the shape of the shoulder pocket. Sandwiched between the stock and recoil pad is a decorative black spacer. 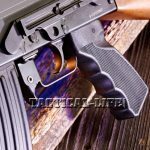 The length of pull measures 13.5 inches, which is significantly longer than a standard AK-style fixed stock. 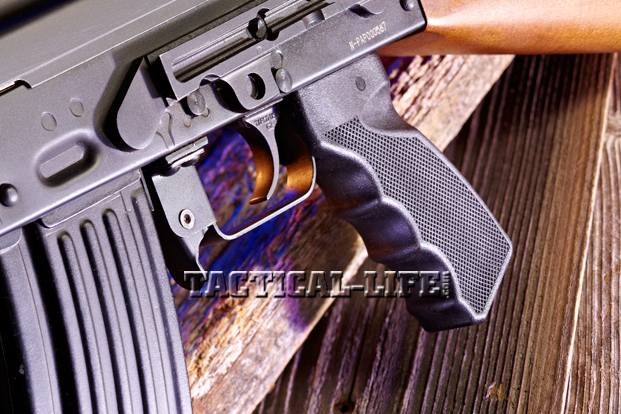 The N-PAP’s forend is made to M70 dimensions, so it’s bulkier than a standard AK as well. Properly sized rails would be required if you wanted to upgrade your gun. I have been told that UTG and other quad-rails made for the Yugo M70 should also fit the N-PAP. 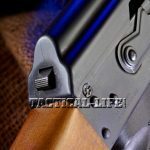 The black synthetic pistol grip has three finger grooves on the frontstrap, while the side panels feature molded-in checkering and dished recesses on both sides for the base of the shooter’s thumb. The grip’s ergonomic contours and texture help ensure better control and help the shooter drive the gun. AKs have no bolt stop, so unless you are counting rounds, going dry will come as a complete surprise with the dreaded bang-bang-bang-click plus expletive. Magazines with bolt-arresting followers are available to address this issue, but when you are on the range that means you still have no way to lock the bolt open unless you have a magazine in the gun, which defeats the whole purpose. What’s worse, a bolt closed on the firing line or a magazine in the gun? Thankfully, with the N-PAP that question is moot, because its safety lever has a notch that captures the bolt handle. To lock the bolt open, simply pull it all the way to the rear and push up on the safety lever. No more improvised chamber flags made from shell casings. On top of the AK-47’s own inherent ergonomic issues, recent imports have added a few of their own, namely wretched triggers. Some were full of creep and stacking, others exhibited the particularly bad trait of transmitting recoil through the trigger blade, which is sometimes known as trigger slap. This was not a product of the original design, because the original AK trigger is very sound. In fact, the arrangement of the sear and hammer are very similar to the M1 Garand’s. Instead this problem was a result of the poor geometry of some early U.S.-made trigger components. In contrast, the N-PAP’s trigger was one of the best I’ve ever tried on a semi-auto AK. My test gun had a two-stage pull that was long but consistent and smooth with no creep or stacking. Clearly Century and Zastava have put a lot of time and effort into addressing many of the AK-47’s most irksome ergonomic issues. 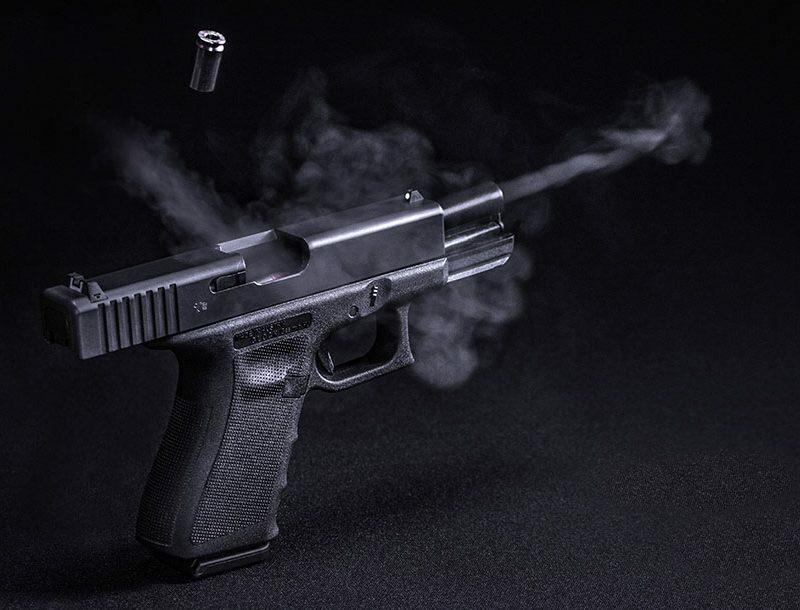 Larger stock dimensions mitigate recoil, and combined with the smooth trigger, it makes it easier to shoot the gun accurately. The safety notch makes the gun more range-friendly. 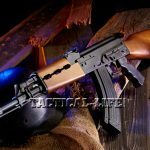 On top of that, all of the essential features and design elements that make the AK-47 system so reliable and formidable are still there. 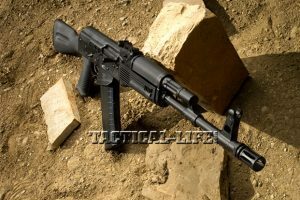 So what does an improved AK-style rifle, in particular the N-PAP, offer shooters? 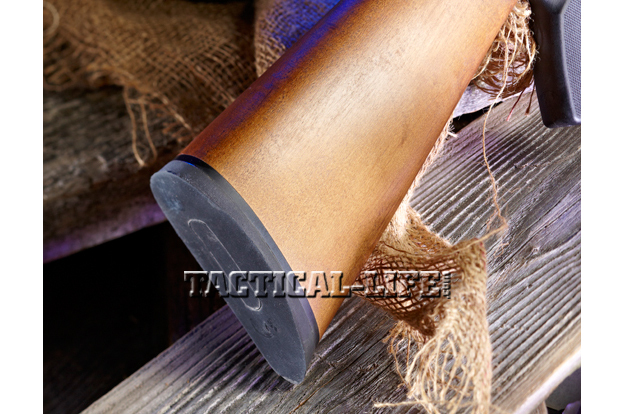 Its 7.62x39mm chambering offers a mixed bag of pluses and minuses. For starters, the N-PAP is not exactly flat-shooting. A medium-velocity cartridge paired with a relatively heavy bullet makes for steep bullet drop. If you zero for 200 yards, the rounds hit the dirt at 300 yards. This, however, may be more of an issue for military users, since many shooters rarely shoot beyond 100 yards. On the other hand, within that 200-to-250-yard performance envelope, it certainly hits hard—and multiple hits can reduce barricades and cover. You can certainly find cheaper AKs, but you would be hard pressed to find a better platform for enhancement than the N-PAP. 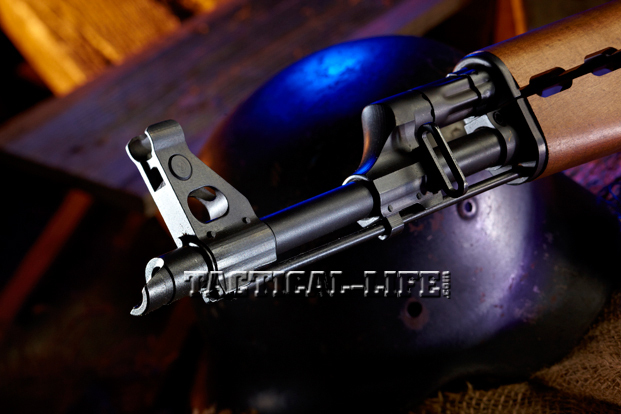 It has a good trigger and is constructed of new parts, so it is built for the long haul. It may never be as accurate as an AR-style rifle, but that doesn’t mean it lacks the necessary accuracy for the job. The N-PAP might have been designed for spray-and-pray marksmanship, but that doesn’t mean it can only be used that way. 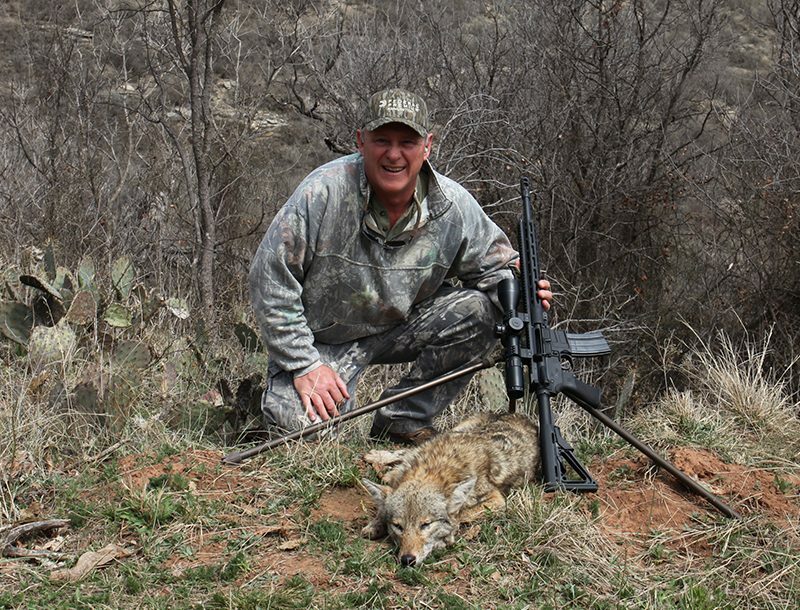 Fitted with a 4x Leupold HAMR scope, my test gun turned in respectable 2.5-inch groups at 100 yards. The N-PAP also displayed good manners at the range. Magazines rocked in and out of the well without any binding or drag. The thick stock aided a sold cheekweld, and the recoil pad kept the stock firmly in my shoulder pocket.